The city tax rate is decreasing — only ever so slightly. An average household's bill will go down by less than 10 dollars. Still, independent Councilor Sharon Bushor emphasized, people should focus on the bottom line: “It’s not going up, it’s going down." 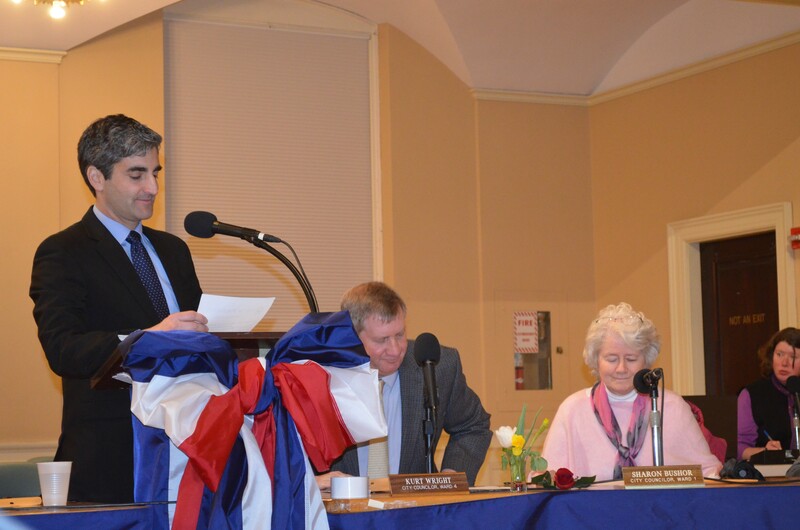 On Monday night, the council unanimously approved Mayor Miro Weinberger’s $185 million budget for fiscal year 2016. Bushor, who sits on the board of finance and is famed for her attention to detail, was in her element Monday night, highlighting noteworthy expenditures among the 3,600 line items. Among them: Burlington will spend $100,000 to study how it can improve its notoriously byzantine permit system — with the goal of providing relief to homeowners who have been stymied when trying to make minor renovations. Bushor also noted that while the municipal tax rate is going down, water, wastewater and solid waste rates are going up — increases that will amount to a few dollars per month for most users. Some of that will help fund replacements of aging pipes after 84 water main breaks betrayed their age last winter. That mayor kept his remarks brief, but he offered highlights in a lengthy memo sent out ahead of the meeting. He noted that the city is setting aside $1 million in reserves and is steadily increasing the amount of cash it has on hand — which he hopes will improve the city's credit rating. He also noted the housing trust fund, which provides capital to affordable housing projects, will get another $175,000 in 2016. The council has been reviewing the budget during the weeks leading up to Monday's vote. The only sticking point that remained unresolved before councilors came to the table was the mayor's proposal to restructure the Community & Economic Development Office. Several councilors expressed concern that the reorganization could diminish the department's ability to address a major problem — housing affordability. In the end, councilors agreed to the change on the condition that the administration follow up with evidence that it's working, and that the decision be reevaluated next year. Most of the blue chairs set up for members of the public were vacant by the time the budget came up for discussion. Residents who showed up for the public forum at the beginning of the night had come to talk about an entirely different topic: the ride-share service Uber. A handful of taxi operators urged the council — not for the first time — to make the company adhere to the same set of regulations that apply to traditional cabs. Two committees are currently reviewing the mayor's proposal to enter into a temporary operating agreement with Uber.